Not since Peter Russell’s indispensable but now many decades old Nationalism in Canada has a collection provided such a comprehensive exploration of the mythologies and paradoxes of the Canadian experience. 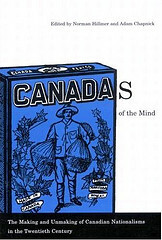 Canadas of the Mind explores how the country’s abundant nationalisms have made and unmade traditional understandings of Canada. From the vantage point of a new century, the volume reconstructs and re-evaluates dimensions of twentieth-century Canadian nationalisms – their meanings, their uses, their contradictions, and the forces that push them toward and away from one another. A diverse group of experts analyse these nationalisms from a range of cultural, economic, intellectual, technological, political, international, and military perspectives. By probing deeply into Canada’s multiple allegiances and identities, Canadas of the Mind offers visions of the nation that will define the country and its constituent parts in the early twenty-first century and beyond. Contributors include Stephen Azzi (Laurentian), Michael Behiels (Ottawa), Sandra Campbell (Carleton), Janice Cavell (Foreign Affairs Canada), Andrew Chung (Toronto Star), Alan Gordon (Guelph), Paula Hastings (Duke), Peter Henshaw (Privy Council Office), Robert MacDougall (Western), Hector Mackenzie (Foreign Affairs Canada), David Newhouse (Trent), James Opp (Carleton), Patricia Roy (Victoria), and Roger Sarty (Wilfrid Laurier).